What is Solidarity of Nations - Achvat Amim? "We do not aspire to return to the land of Israel with which we have inseparable historical and spiritual ties in order to supress another people or to dominate them." In addition to the core Achvat Amim program of volunteering and learning, the Ruchani track provides an opportunity for halachically rooted Jewish living and spiritual practice, as well as rigorous and reflective Jewish learning, as a foundation upon which to engage with issues of the conflict, justice work and human rights. Achvat Amim Ruchani Track consists of four components: Volunteer Work, Achvat Amim Learning, Beit Midrash Learning, and Jewish Living and Practice. Together with the core Achvat Amim track, Achvat Amim: Ruchani participants are involved in hands-on work with educational, community, and human rights organizations, such as Rabbis for Human Rights, Hand in Hand: Center for Jewish-Arab Education, Tent of Nations Sustainable Farm, Roots, Palestine-Israel Journal, and others. Participants volunteer as a group at the Hand in Hand School and in a variety of individualized placements, which offer experiences that have constructive impact on the communities with which participants are engaged. Together with the core Achvat Amim track, Achvat Amim: Ruchani participants will engage in experiential learning with leaders in the field through seminars, meetings, travel, and outdoor experiences. 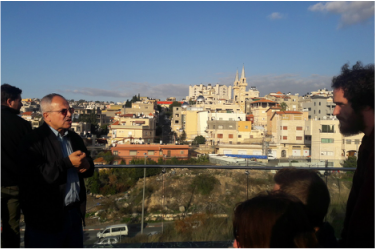 Achvat Amim builds a dynamic learning community that engages with the core issues of conflict and occupation as well as wider social justice issues in the region. Learning days cover themes such as Jewish identity culture and thought, Zionism, nationalism, Israeli and Palestinian politics, activism, community organizing, and more. In addition to exploring social and political content, language learning is a central component of the Achvat Amim program, and participants study both Hebrew and Arabic on a weekly basis. Unique to Achvat Amim: Ruchani, is the Jewish learning component. It will involve a combination of text-based learning, seminars, chassidut, Jewish meditation and prayer, shabbat and holiday observance, and integrated spiritual reflection. The text-based learning covers a variety of topics with the intent of providing serious, nuanced, and holistic Jewish learning. Taught by leading scholars and educators, these units will include such topics as Judaism and human rights, the Zohar, gender and Judaism, and prayer within Judaism. 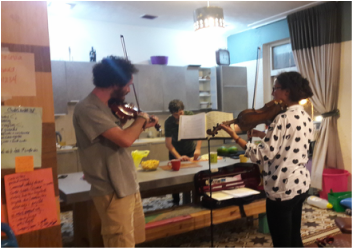 Achvat Amim: Ruchani participants will live communally in an apartment in West Jerusalem, in an environment where kashrut, shabbat and holidays are practiced and explored. Together, participants will deepen their Jewish life and practice; engage in spiritual exploration and conscious community building; and taste the life and culture of Jerusalem. Achvat Amim: Ruchani track brings a halachic sensibility rooted in Jewish values as the lens through which to understand and experience the modern realities of Jerusalem and the Israeli-Palestinian conflict. It is geared towards those who are committed to peace building, human rights, and justice work in the context of the occupation and conflict, and those committed to Jewish life, innovative Jewish learning and intentional practice. Through a personal and collective process of spiritual exploration, reflection, and development, participants will explore how Jewish values and identities inform the ways they engage the world in general and the conflict in particular. Who should apply for Achvat Amim Ruchani? This program is for you if you want to engage with peace building and justice work, Jewish learning and Jewish practice; if you are curious about spiritual exploration as an individual and as part of a collective; if you want to embrace your Jewishness and engage thoughtfully and genuinely with Zionism and the conflict; if you are interested in living in an open and halachically informed atmosphere that includes creative spiritual practice; if you are interested in being exposed to a variety of religious experiences and political ideologies. We are looking for participants between the ages of 20-30 who have been to Israel before; have some background in the subject matter at hand; and are excited about a creative and participatory learning environment for building identity, practice, knowledge, and community. Interested? Fill out an Application Form today! Solidarity of Nations - Achvat Amim by A. Daniel Roth is licensed under a Creative Commons Attribution-NoDerivs 3.0 Unported License.